This is George Haggar, born Wallington, Herts, who came to live with my Paternal Grandmother, in Stevenage from where he enlisted at Bedford into the 1st Battalion, Bedfordshire Regiment on 1st February 1915 . 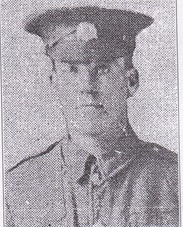 He was then posted to France on 3rd November 1915 . Where he went or what he did between then and his death on 27th 1916 I do not know, but, from information received he was killed during an attack on Longueval , France aged 20. He has no known grave, but is commemorated on Pier & Face 2c of the Theipval Memorial, France. Before enlisting, he worked as a hay-tier for John Inns of Stevenage . You can find out more about other Stevenage men who died in the Great War by following this link to the Stevenage at War website. In loving memory of Private George Haggar of Wallington, who was killed in action July 26 1916 aged 20years.